Fans of the John Travolta–Olivia Newton-John film know the subtitle of this production is redundant. What’s Grease without its signature songs like “You’re the One That I Want” and “Greased Lightning”? This new performance takes its characters back to the Chicago setting of the original 1971 musical, but otherwise it’s the same story you grew up with. Grease is still the word. Winter Garden Theatre, 189 Yonge St.
German artist Bandau has exhibited work in more than 45 museum collections throughout his half-century career. His works in wood, metal and watercolour have had an uninterrupted run during that time, always on display in at least one major showing. The Nicholas Metivier Gallery brings a selection of his paintings and sculptures to Toronto this fall. Nicholas Metivier Gallery, 451 King St. W.
The largest indoor agricultural fair in the world visits Toronto every November, bringing with it giant vegetables, pet-able farm animals, performing dogs and one of the most renowned international equestrian competitions anywhere. While you’re there, don’t forget to take in the butter sculptures, relax with a session of goat yoga or enjoy an evening of wine tasting. Experience Icelandic food and culture at the seventh annual Taste of Iceland Festival. Try traditional Icelandic favourites like langoustine, arctic char, fried lamb fillet and skyr with a special tasting menu at Leña, and attend a concert, literary event and concert, all in celebration of the island’s vibrant cultural scene. Dave Andreychuk, Clare Drake, Jeremy Jacobs, Danielle Goyette, Paul Kariya, Mark Recchi and Teemu Selanne will all be welcomed into the Hockey Hall of Fame at this year’s annual weekend of festivities. Along with special guest appearances, Q&A fan forums and autograph signings, Sunday afternoon’s Legends Classic will feature a star-studded lineup. Cheer on your favourite hockey hero at the Air Canada Centre, as teams lead by Mark Messier and Jari Kurri face off against each other. It’s hard to believe the Total Blackout Tour is Chris Rock’s first time on the road in nine years. The comedian has received rave reviews to date, with an act focusing on Rock’s strengths: making jokes about race relations, politics, and relationships—in particular the dissolution of his marriage in 2014. Air Canada Centre, 40 Bay St.
eats and a selection of more than 1,500 wines, beers, and spirits. Among the purveyors at the 23rd edition are exhibitors such as Cannoli Queens, Stonetown Artisan Cheese and Barilla Pasta. Thirsty guests can visit the Spiritology Pavilion for a tipple, or join a Tutored Tasting seminar to learn about fine wines and spirits from the experts. Live programming continues at the Chef Stage, which hosts demonstrations from an all-star line-up, including celebrity chef Emily Richards. Metro Toronto Convention Centre, 255 Front St. W.
The Santa Claus Parade has been an annual Toronto tradition since 1905. Kids of all ages line the streets along Santa’s route to catch a glimpse of upside-down clowns, marching bands, and, of course, the man in red himself. The parade starts at 12:30 p.m. at Christie Pits Park and works its way along Bloor Street, down Avenue Road, and across Wellington Street to the St. Lawrence Market. Some years are colder than others, so dress warmly, and bring a Thermos of something hot to drink. Christopher Boone—the lead character in Simon Stephens’s stage adaptation of Mark Hadden’s popular novel—is a highly intelligent 15-year-old boy who’s gifted at math but who has trouble making sense of everyday life. When he becomes a suspect in the death of a neighbour’s dog, he begins an investigation to find the real culprit. Princess of Wales Theatre, 300 King St. W.
Find gifts and inspiration at the One of a Kind Show & Sale, a juried event that celebrates all things crafted and handmade. Held twice annually, the winter edition features more than 500 designers and artisans, with a variety of merchandise ranging from jewellery to preserves to ceramics. Visitors can browse vendor tables, hear talks at the main stage and learn about the crafts and techniques from the makers themselves. Ross Petty Productions has been staging family friendly Christmas pantomimes (musical comedies loosely based on a traditional fairy tales that employ slapstick, cross-dressing and topically based jokes) for 22 years, and yet this year’s edition is the first to actually have a Christmas theme, taking on the Dickens classic A Christmas Carol. Not that it matters: if you’re paying too close attention to the plot of a pantomime, you’re missing all the fun. Elgin Theatre, 189 Yonge St. Celebrate the start of the holiday season with thousands of other revellers at the 49th annual Cavalcade of Lights. Watch as the city’s official Christmas tree is illuminated with more than 525,000 lights, and enjoy the energetic live performances, skating parties and impressive fireworks. Even if you miss the big event, you can still view the lit-up tree each night throughout the holiday season. Nathan Phillips Square, 100 Queen St. W.
Christian Dior was one of the most influential fashion designers of the 20th century, known for his use of luxury textiles and gorgeous embroideries. To celebrate the 70th anniversary of the House of Dior, the Royal Ontario Museum displays items from its rarely seen collection of haute couture pieces designed by Dior from 1947 to 1957. To mark the country’s sesquicentennial, the Ryerson Image Centre was gifted a vast trove of 25,000 Canada-centric photographs from the New York Times photo archive. This exhibit displays but a small number of them, highlighting images of major political events, beautiful landscapes, and portraits of notable Canadians. Ryerson Image Centre, 33 Gould St.
Ed Mirvish Theatre,244 Victoria St. In 1862, English nobleman Viscount Milton and physician Walter Cheadle travelled across Canada, looking for a direct route to the Cariboo goldfield in British Columbia. The story of their trip was detailed in a book, illustrated by Cheadle, called The North-West Passage By Land. This fall, visitors to the Gardiner Museum can view 13 pieces, from both public and private collections, of a commemorative tea set featuring hand-painted art inspired by the book’s drawings. Lavish textiles, patterned carpets, paintings and inlaid metalwork from the 13th to 17th centuries are on display at the Aga Khan in this debut exhibition of one of the most important private collections of Islamic art in the world. Aga Khan Museum, 77 Wynford Dr. Celebrate the start of the holiday season on November 28 as the annual Cavalcade of Lights illuminates City Hall and Toronto’s official Christmas tree. More than 300,000 LED bulbs adorn the massive white spruce, which shines nightly through to the end of the year. The free, family-friendly event at Nathan Phillips Square features a DJ skating party, live musical performances by the likes of Sloan and the Nathaniel Dett Chorale, and a spectacular fireworks display. Nothing warms a cold November day quite like good food and a stiff drink. With more than 1,500 wines, beers and spirits to sample, as well as a selection of gourmet food tastings from Toronto’s top chefs, the Gourmet Food and Wine Expo delivers. The weekend-long event offers access to top winemakers and craft brewers, cooking demos, tasting workshops and much more. The Design Exchange relaunches as “Canada’s Design Museum” while celebrating the work of cultural “game changer” Douglas Coupland tonight at DX Intersection, its annual fundraiser. Multiple DJs, performers and a silent auction of artist-reimagined Ikea products provide entertainment, while the Food Dudes food truck keeps mouths and stomachs full well into the night. The Royal Ontario Museum’s Friday Night Live event series brings you good eats, good tunes, and, tonight, a screening of the 1972 Summit Series hockey final in honour of the 40th anniversary of this legendary game. Bite into a sandwich care of Fidel Gastro’s Matt Basile or savour delicious treats by Waffle Bar’s Valerie Bain while you toast the T-Rex skeleton to your left. Don’t miss this chance to enjoy the hockey action you’ve been missing, all while exploring the ROM’s hallowed halls after hours. Ring in the holiday season with Toronto’s annual Cavalcade of Lights at Nathan Phillips Square. Dragonette and Suzie McNeil are just two of the performers who will grace the stage as City Hall is illuminated and fireworks mark the lighting of Toronto’s official Christmas tree. Festivities for the 100th Grey Cup have also taken over Nathan Phillips Square. The event’s Adrenaline Zone dares you to take a leap with North America’s tallest urban zip line while Yonge-Dundas Square’s Nissan Family Zone gives you an opportunity to teach your little one how to throw a ball. Later, gather everyone together and check out a screening of Jerry McGuire at the Rushes Football Film Festival at Scotiabank Theatre. How’s that for a touchdown celebration? To locals, a trip on the 501 Queen streetcar can sometimes feel unbearably long. But for visitors, a trip on North America’s longest surface public transit route is a great way to see the city. Today it’s also a great way to get some grub. Sign up for Foodies On Foot’s Streetcar Food Tour, a six-neighbourhood restaurant-hopping taste-a-thon that’s will help you travel the path from Toronto-dining neophyte to expert in just one night. Bundle up the kids and head on down to the Santa Claus Parade for an afternoon of elves, upside-down clowns, marching bands, floats and more. Be on the lookout for a Grey Cup float with a four-metre replica of the trophy and Mike “Pinball” Clemons at the helm, as well as a One Direction float inspired by the popular British Boy Band. Christmas comes early for the canine in your life with Winter Woofstock at the Direct Energy Centre. Lavish your pooch with fashion, food, furnishings and accessories and get their picture taken with Santa. Dog pageants, races and a dating soirees are just some of the fun events that are sure to keep tails wagging. Matinee and evening shows today offer one last chance to catch the pre-Broadway run of Jekyll and Hyde. The intriguing and dark story of a man fighting multiple identities stars former American Idol contestant Constantine Maroulis and R&B diva Deborah Cox, who deliver performances that are not to be missed. NOVEMBER 26 Even after 44 years, the lighting of Toronto’s official Christmas tree never gets old. The bulbs on the tree have evolved since the first shining spectacle in 1967—it now features thousands of energy-efficient LEDs—but the reason for the illumination remains the same: to mark the beginning of the holiday season. This festive event known as the Cavalcade of Lights also features a live concert and a dazzling fireworks display. And don’t forget to bring your skates and glide around the ice rink. Nathan Phillips Square, 7 p.m., free admission; call 311 (within the city) or visit here for more information. This weekend, art, comedy, music, dance, and a great winter celebration are sure to entertain (and keep your mind off of the increasingly cold weather). Friday: Learn about the creative genesis of Tim Burton films such as Mars Attacks! The work of Tim Burton is celebrated with an enormous, acclaimed exhibition at the TIFF Bell Lightbox. Drawings, storyboards, and even pieces from Burton’s personal collection are just some of the items comprising this examination of the idiosyncratic American auteur. See (and hear) Barbie as never before in Barbie at the Symphony at the Sony Centre. This production combines well-loved Barbie Princess films with live classical-music accompaniment performed by the Kitchener-Waterloo Symphony. Comedic scenes, songs, and improv make up The Second City’s Dysfunctional Holiday Revue. Catch a matinee performance of this hilarious alternative to the traditional holiday show. It’s a great way to spend the afternoon and get into that good old holiday spirit. Get three ballets in one tonight as the National Ballet of Canada presents Chroma, Serenade and Emergence as a triple bill. The first dance pairs classical dancing with the music of The White Stripes. The second is a plotless piece that focuses solely on the beauty of dance, while the final work explores the pressures of social norms. The unveiling of Toronto’s official Christmas tree occurs tonight at the Cavalcade of Lights. Fireworks and live performances by such acts as Shawn Desman will all be taking place in celebration at Nathan Phillips Square. Ozzy Osbourne, arguably one of the most entertaining men in rock and roll, strides on to the Air Canada Centre stage to perform tracks from his new album, Scream, as well as some past hits. It’s sure to be an interesting night with this former reality star in the spotlight. Wicked, the enthralling tale of the witches of Oz in the days before Dorothy, takes its final bow today at the Canon Theatre. Beautiful (and award-winning) costumes, sets and singing make this a definite must-see! It’s also your last chance to check out the challenging works featured in Traffic: Conceptual Art in Canada 1965-1980. This exhibition, displayed across four different galleries, curates an important period in the development of modern Canadian art. Thrill to the magnificent musicality of pianist Stewart Goodyear, who performs this evening at the Royal Conservatory’s Koerner Hall. Praised for his creativity, Goodyear is set to showcase his skills with a selection of Beethoven sonatas. NOVEMBER 27 Witness the heart of downtown Toronto illuminate the night sky at the 44th annual Cavalcade of Lights. This jump-start to the holiday season sees City Hall and its surrounding area shine with a colourful display of luminescence that includes a mesmerizing fireworks show and the lighting of the city’s official Christmas tree. For more dynamic entertainment, check out the jaw-dropping aerial stunts performed by trampoline acrobats, plus live concerts by such artists as Divine Brown. End your evening at the public skating party while a DJ spins upbeat tunes. Nathan Phillips Square, 7 p.m., free; call 416-492-2489 or visit here for more information. It can be tempting to hibernate the holidays away. But if you bundle up and face the wintry winds outdoors, you’ll be rewarded with lights, treats and high spirits this season. 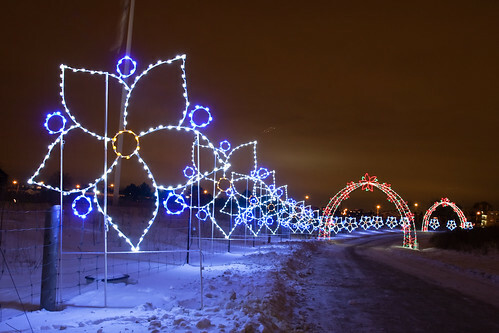 If you’ve never had a reason to head north to Downsview Park (at Keele Street and Sheppard Avenue), the “Trail of Lights” provides more than 400,000 radiant reasons to do so. Open from 6 to 11:00 p.m. every night until January 3, the three-kilometre trail winds through illuminated arches into 16 themed areas and the park’s Canada Forest, amazing visitors with energy-efficient LED lights in the form of blizzards, reindeer, Santa Claus and the country’s largest walk-through Holiday Tree. Whether you drive or walk the sparkling route, you’re sure to be spellbound. 1–35 Carl Hall Rd., $7 per person on Walk-Through Wednesdays, $20 to $50 per vehicle on other days; call 416-952-2222 or click here for tickets. Maybe a night aboard one of the heated, beautifully decorated Mariposa Cruise Line ships doesn’t technically count as an outdoor activity, but with its breathtaking views of Toronto’s harbourfront and skyline, the four-hour Holiday Dinner Cruises on December 5, 12, 18 and 19 afford a unique, luxurious way of celebrating with loved ones as you enjoy the city’s beauty from afar. Feast on a sumptuous buffet-style dinner featuring prime rib, roast turkey and other holiday mains while listening to ambient music guests can dance to. Boards at Queen’s Quay Terminal, 207 Queens Quay W., $72.95; call 416-203-0178 or click here for tickets, as reservations are required. Head outside on any night this December and be dazzled by the Cavalcade of Lights in diverse neighbourhoods across the city. See Chinatown’s dragons, Little Italy’s trumpeting angels, Koreatown’s tiger, Yorkville’s sparkly storefront displays and Yonge-Dundas Square’s polar bears. On Saturday nights, end up at Nathan Phillips Square, where Toronto’s official Christmas tree towers over revelers waiting for fireworks and free concerts. Live performances by State of Shock on December 12 and Faber Drive December 19 entertain music-lovers, followed by DJ’s spinning alternative music for the skating fanatics. Call 416-338-0338 or click here for more information. You won’t wish for a river you can skate away on if you find your way to the Harbourfront Centre’s Natrel Rink. The country’s largest artificially refrigerated outdoor rink boasts a good view of the waterfront and is a great venue for free DJ Skate Saturday Nights, when different DJ’s play house music, blues, jazz and even ambient electronica while skaters glide across the ice every Saturday from December 5 to February 13 (except December 26). For beginners, rink offers several learn-to-skate classes, drop-in clinics and private lessons. Afterwards, you can enjoy warming drinks by one of the controlled fireplaces overlooking Lake Ontario. 235 Queens Quay W., free ($7 for skate rental); call 416-973-4093 or click here for more information on skating classes. Here’s a unique way to spend the morning after an indulgent holiday banquet: join fellow animal-lovers in pampering the creatures that delight Toronto Zoo patrons all year long. From 10 to 11 a.m. on December 26, the 34th annual Christmas Treats Walk lets visitors feed treats and seasonal goodies to the zoo’s resident reindeer, Siberian tigers, polar bears and other beasts. Participants will be treated to free hot chocolate at the new Tundra Trek and entertained by carol singers during the walk. On Meadowvale Rd., north of Hwy. 401, half-price admission all day; call 416-392-5929 or click here for further details. The city’s cultural hub boasts top theatres, restaurants and shopping—plus the fun, fast-paced feeling of being at the centre of it all. Click on any map marker for more information on Where’s neighbourhood favourites.